St. Scholastica’s College, Manila was host to the 6th Benedictine Educators Network (BENET) Global Conference on October 23-26, 2013 with the theme “Benedictine Education: A Gift to the World.” Two hundred Benedictine and Cisterian monks, sisters, and the lay collaborators from 18 countries in 6 continents had good conversations sharing the Benedictine way of teaching while learning from each other across the globe. The countries represented at the triennial conference were Angola, Australia, Brazil, Chile, Colombia, Ireland, Italy, Germany, Kenya, South Africa, Spain, Switzerland, USA, Philippines, Uganda, United Kingdom, and Tanzania. 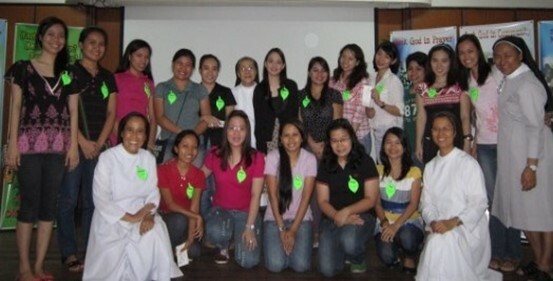 Among the 200 participants, 33 sisters were from the Congregation of the Missionary Benedictine Sisters of Tutzing, coming from the Philippines (25), Kenya (2), Tanzania (2), Brazil (2), Angola (1) and Uganda (1). The global conference was organized by the members of the International Commission on Benedictine Education spearheaded by its president, Fr. Christopher Jamison, OSB of Worth Abbey. 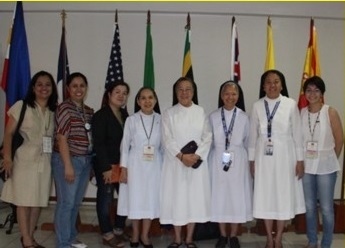 Moreover, the presence of the Abbot Primate, Dr. Notker Wolf, OSB, Sr. Adelaida Ygrubay, OSB, Prioress, and Sr. Lydia Villegas, OSB, Subprioress, lent valuable support to this laudable undertaking of the ICBE. The opening program held Oct. 23 at St. Cecilia’s Hall consisted of a parade of colors of different countries representing the delegates, the invocation to the Holy Spirit with Choreography followed by the words of welcome by Sr. Josefina Nepamuceno, OSB, Executive Director of ABS and Chair of BENET 2013 organizing committee, Sr. Mary Thomas Prado, OSB, President of St. Scholastica’s College, Manila and co-chair of the Conference Committee and lastly, Fr. Christopher Jamison, OSB, President of ICBE. In line with the celebration of the Year of Faith and the BENET 2013 conference’s theme, two exemplary keynote speakers for the plenary sessions were invited. Sr. Mary John Mananzan, OSB, Executive Director of the Institute of Women Studies, St. Scholastica’s College, Manila, spoke on “The Good Zeal: The Spirituality of Benedictine Academic Leaders.” She stressed the essentials of educating the youth of today in the Benedictine spirituality alongside the formation of servant and prophetic academic leaders in Benedictine institutions working towards justice and social transformation. In his keynote speech, Reverend Eugene Sylva of the Pontifical Council for the New Evangelization, discussed, “The New Evangelization in our Catholic Schools: Creating a Culture of Belief and a World of Difference.” He passionately urged all Benedictine educators present to become shepherds of evangelizing communities and at the same time build Benedictine schools as centers of the new evangelization. A panel of three speakers from among the delegates gave reactions after each talk. In keeping with the Benedictine stress on leisure, on Tuesday, October 23rd an evening cultural show depicting Filipino culture and tradition in dances and music was rendered by the Bayanihan Dance Troupe, sponsored by SSC-Manila. The instrumentalists of SSC-Manila, School of Music, entertained the delegates during the welcome dinner in Friedenshaus Hotel School offered by the President of St. Scholastica’s College, Manila. On Thursday night, the Opening Holy Mass had as main celebrant Msgr. Gerry Santos, with music rendered by a small choir and orchestra of the SSC-Manila College of Music. As announced by Fr. Jamison, mass collections from the delegates will be donated to earthquake victims in Bohol. Dinner was sponsored by SSAFI with entertainment among others by Abbot Notker Wolf, OSB who played the flute and the Boys of Emphysema followed by dancing in the pergola enjoyed by many of the delegates including the Sisters. On Friday, a brief campus tour preceded the Holy Mass in the Abbey Church of Our Lady of Montserrat. Gregorian chant was the main music during the liturgy of the Votive Mass of St. Benedict with Abbot Primate Notker Wolf, as the main celebrant and homilist. Dinner followed with entertainment by San Beda College students. The participants were given a free tour of the Ayala Museum which showcased in diorama the history of the Philippines. On Saturday, the BENET conference closed with a thanksgiving Mass enlivened by African songs and instruments led by the five African countries.